The rock solid foundation of your software projects. Capture, organize, manage and elaborate requirements with a powerful use case tool, Visual Paradigm. Visual Paradigm features UML use case diagram, use case flow of events, Use Case Note, wireframing, SysML requirements diagram, Requirements List. Be efficient in requirements capturing. Choose a use case tool that helps. 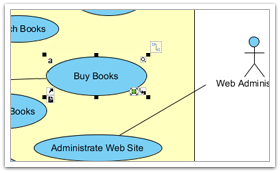 Flexible use case diagram tool that facilitates intuitive use case modeling and use cases management. With the intuitive use case editor, you can capture user oriented requirements more easily than ever. Specify the system usage and operation behavior behind every use case step-by-step, using the Flow of Events editor. 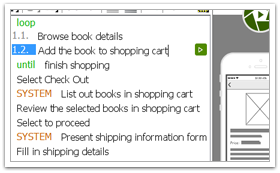 Besides the steps, you can draw wireframes to visualize the suggested screen layout and screen flow. 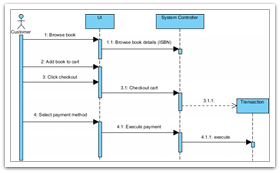 Model use-case based system interactions by elaborating use cases with UML sequence diagram. As an end-to-end use case tool, Visual Paradigm maps project requirements with behavioral model, and other software design blueprints.